I’ve been working on my back porch makeover since 2011. Which is sad when I think about it because we’ve lived in this house since 2008. But it wasn’t on the top of my priority list when we bought the house. That is until we started spending a lot more time outside to tend to our garden and play in our playhouse. It’s a small space but I knew we could utilize it for our small family. 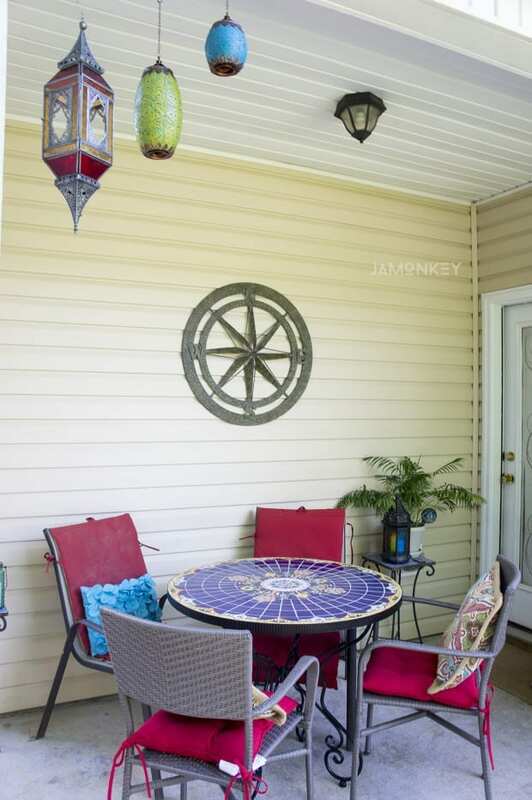 Last summer, I found a few pieces at Pier 1 Imports that I fell in love with and decided to model the entire back porch around. 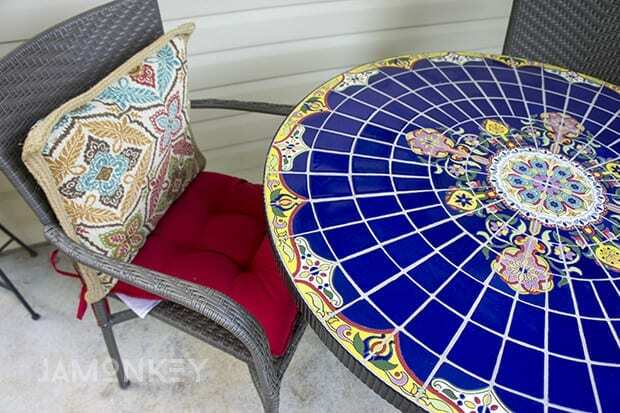 Along with the Moroccan lanterns, I also bought some outdoor pillows and matching napkins for entertaining. I knew it was still missing a lot though, including something to hang on my back wall and a place where we could eat. I’m so excited to be finished with the final Global themed design. Scroll down to see the before and after. 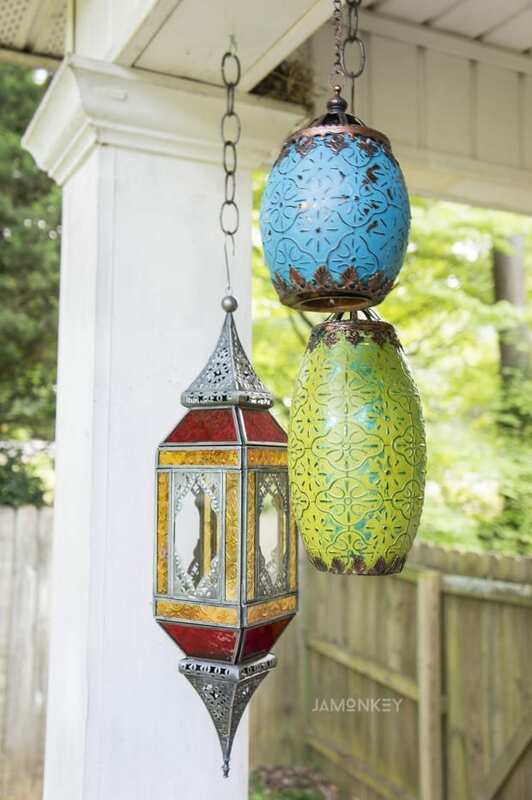 Considering the items I already had, I bought a few more lanterns to hang as well. Pier 1 Imports has these fantastic LED flameless candles as well that I was able to put into all of the lanterns. I can control them with a remote control by setting a timer on them in case I forget they are on at night. I also found a few citronella candles to keep the bugs away while we are dining on my new favorite piece, the blue Rania table. The table is the perfect size for a small porch. It doesn’t take up a ton of space, making it hard to maneuver around to get to the grill. We needed a few chairs to go with the table so I picked out the grey stacking chairs with bistro cushions to go with it. Now we can enjoy a family dinner outside, and we love to grill out when the weather gets nice, so it will be used quite a bit. 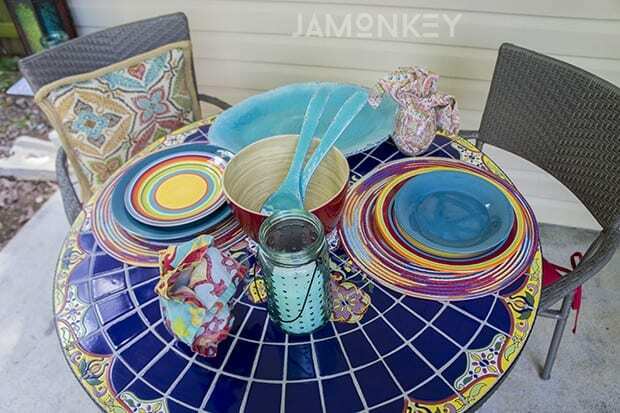 We love entertaining as well so I found some great colorful placemats to go with my bright and colorful plates. Pier 1 Imports also has a great line of Melamine and Acrylic dinnerware that are strong enough to handle drops or just kids and clumsy parents. I found a beautiful turquoise blue serving tray and tongs set as well as a set of stemless drinkware. The decorative lanterns that I hung from the ceiling bring the global theme together with embellishments and bright colors. 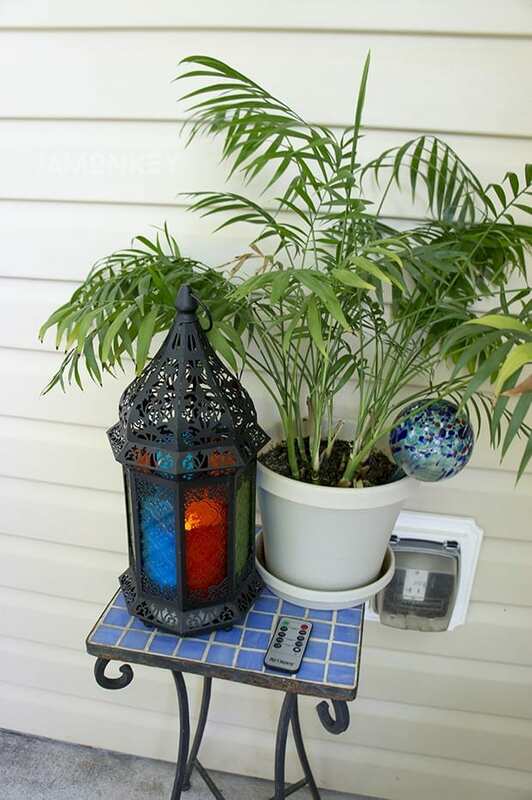 Plus, with the LED flameless candles inside, it creates a beautiful ambiance at nighttime. I finally found the perfect piece for our back wall! The Garden Compass was the finishing touch to pull the theme together. I thought I had wanted a metal star on the wall but when I saw the compass I knew it was exactly what the wall needed. Aside from a few minor landscaping fixes that we need to make to help with some drainage issues, our back porch is finally complete. I’m so happy with it. Which I’m sure you guessed just from looking at this before and after picture. BEFORE AFTER The next step in our backyard renovation will consist of building a Shred-office for us to work from home in. We plan on connecting it to the house by a deck walkway. I’ve already starting drawing up plans for it. I plan on having another sitting area around our fire pit on that deck so I’m sure I will extend this theme into that area as well. That will be another few years though I’m sure. Find what speaks to you. See our Outdoor Living collection in stores or at pier1.com/outdoorliving From Thursday, 5/28 – Sunday, 5/31, ALL OUTDOOR FURNITURE WILL BE ON SALE, 20% – 50% OFF! What do you guys think of my backyard oasis? I think the hanging candle lanterns are my favorite part of this makeover. I really want to change the look of my porch as well. Hopefully, my porch will end up as lovely and colorful as this one.